After last night's pesto pasta, I have, as usual, got some leftovers. Today I have enough pesto leftover for 2 people for dinner. However, it's dull to have the same thing two nights in a row, right? 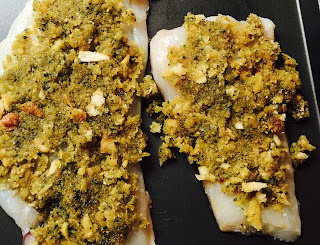 So I was racking my brains at work this morning (I was in work at 4am so by 11am it was basically dinner time in my head) and thought about having a delicious piece of cod with a pesto crumb and Mediterranean vegetables. I also have some wine left over from last night (hello, Sauvignon Blanc!) 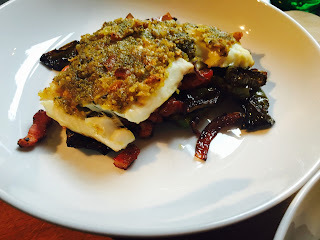 so this fish recipe is perfect and quick for tonight; it's actually cooking away quite happily while I type this. 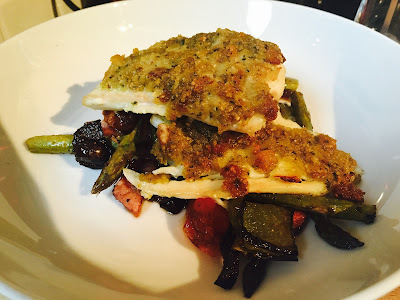 So here it is; Pesto crumb cod with roasted Mediterranean vegetables. Pre-heat the oven to 180 degrees celcius. Place the pepper and onion onto a roasting tin and drizzle with half the olive oil and half the balsamic vinegar. Then give a quick dusting with salt and pepper. In the meantime, combine the pesto and breadcrumbs with a little olive oil (around 1 tablespoon) and spread onto the cod fillets; press down to make sure that there is a relatively compacted layer of the pesto crumb on the cod. 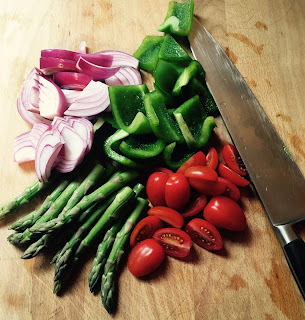 After the 20 minutes has lapsed on the vegetables, put the asparagus and the tomatoes on the same tray as the pepper and onion and drizzle the rest of the olive oil and balsamic vinegar on the vegetable and sprinkle the chilli flakes over all the vegetables. Put the vegetables and the cod into the oven and cook for around 15 minutes, or until the asparagus is tender and the cod's pesto crumb is lightly golden. Serve in a wide bowl with the veg underneath and the cod resting on top. Serve and enjoy! Let me know what you think of this recipe. Follow me on twitter @AsWarmAsToastUK or find me on Instagram aswarmastoast. Or subscribe to my blog.